Next week Donald J. Trump returns to the United Nations for the annual opening of the UN General Assembly. While Trump exceeded expectations during his first UN appearance last year, he will face more pushback this time around. The president will encounter a more skeptical global audience, woke to the reality that his administration's diplomacy is all take and no give. 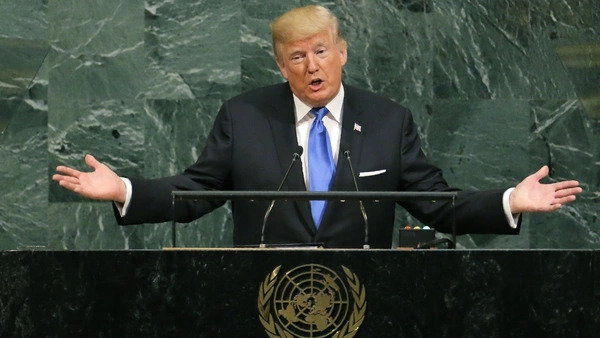 The world will be on tenterhooks next week when Donald J. Trump returns to the United Nations, reprising his role as an America-First bull in the globalist china shop. After a surprisingly smooth 2017, U.S. relations with the world body have deteriorated, thanks to hardline positions on Iran, the Human Rights Council, and Palestine. The administration's unilateralism is wearing thin, as member states tire of America's browbeating and unwillingness to compromise. The president is discovering the limitations of his hyper-nationalist, unilateral approach to diplomacy, which provides few incentives for other countries to align themselves with American purposes. Leadership, it turns out, requires followers. A year ago, in his maiden appearance before the annual opening of the UN General Assembly (UNGA), the President exceeded expectations. These were admittedly low: in the previous months, he had withdrawn from the historic Paris climate agreement, approved a budget to slash UN funding, and appointed a UN envoy, Nikki Haley, who promised to "take names" of countries that thwarted U.S. aims. As events transpired, the President exceeded admittedly low expectations at the UN General Assembly. To the relief of his UN audience, Trump declared himself prepared to help the UN live up to its potential. He aligned himself with Secretary-General Antonio Guterres' UN reform agenda, even co-hosting a meeting of member states on that topic. He also won plaudits from UN delegations by dispensing with shopworn presidential rhetoric about American exceptionalism and for invoking the principle of sovereignty—a word he used twenty-one times in his speech to the General Assembly—as the ultimate foundation of world order. Getting down to brass tacks, the president declared: "I will always put America first, just like you, as the leaders of your countries will always, and should always, put your countries first." This was the president's biggest applause line. It suggested that America First was compatible with inter-governmental cooperation among sovereign, self-interested, independent states. Next week, the president will encounter a more skeptical global audience, woke to the reality that his administration's diplomacy is all take and no give. During the past year, the United States has repudiated the Joint Comprehensive Plan of Action (JCPOA) on Iran's nuclear program, over the entreaties of its closest allies. It has defected from the UN Human Rights Council, allowing the world's foxes free rein in that henhouse. It has unilaterally moved the U.S. embassy in Israel from Tel Aviv to Jerusalem, while ham-handedly threatening UN member states with the temerity to condemn that decision in the General Assembly. It has ended funding for the UN agency that supports Palestinian refugees, while planning to eject the Palestinian embassy from Washington. Last year, the administration suggested that "America First" was compatible with inter-governmental cooperation — next week, the president will encounter a more skeptical global audience. It has embraced discrimination and protectionism, embarking on a trade war with China and even hinting that it may leave the World Trade Organization. Finally, it has launched an all-out assault on the International Criminal Court, to which more than half of UN member states belong. This month, the United States holds the rotating presidency of the UN Security Council. In an unprecedented development, Council members could not even agree on a program of work, given disagreement over whether to include a discussion on the deteriorating political situation in Nicaragua. More provocatively, the United States previously scheduled a special session on September 26—which President Trump himself would chair—on "Iran's violations of international law," including its destabilizing regional activities. As Haley explains, the president is "very adamant" about holding Iranians accountable and forcing them "to stand up and explain themselves." The meeting has now been expanded to cover a “broader range of issues,” including the “proliferation of weapons of mass destruction.” U.S. officials—and perhaps even allies Britain and France, still committed to the JCPOA—convinced Trump that the Iran-driven session would likely backfire diplomatically, underscoring American rather than Iranian isolation. No doubt this meeting would have made good theater, particularly if Iran's delegation showed up, as protocol allows. But Iran is still likely to come up, and Trump will no doubt hammer them on their alleged violations. The final red flag concerns personnel changes within the Trump administration. This time last year, "nationalists" and "globalists" were vying for ascendancy within the White House. Today the former are triumphant. As U.S. Ambassador to the United Nations Nikki Haley explains, the president is "very adamant" about holding Iranians accountable and forcing them "to stand up and explain themselves." The uber-sovereigntist John Bolton, who openly disdains the UN, has replaced the pragmatist H.R. McMaster as national security advisor. Bolton has long advocated treating all US financial contributions to the UN — including legally binding, annual assessments to its regular and peacekeeping budgets — as purely voluntary. Besides violating international law, such a step would create financial havoc for the world body. All of these trends could well make life impossible for António Guterres, who has skillfully cultivated working relationships with Trump, Haley, and internationalist members of Congress. That would be a tragedy. Guterres is as good a UN Secretary-General as Washington could hope for. The former leader of a democratic ally (Portugal), he is committed to pragmatic reform of the UN's budgetary and management systems, peacekeeping operations, and development programs. Critically, he possesses credibility across the UN membership. The Trump administration's belligerent style could well upend Guterres fragile balancing act, however, forcing him to choose between the UN's wealthiest and most powerful nation and other UN members, forever anxious that the secretary-general will become America's lackey. Almost two years into the America First era, the United States is reaping the consequences of abdicating global leadership and retreating into narrow-minded nationalism. One of the casualties of U.S. conduct, as Gutteres lamented last week, is American "soft power." Other UN member states no longer look to the United States as a natural leader, or even a reliable partner. They have tired of Trump's my-way-or-the-highway act and are increasingly hitting the road—or looking to China to fill the vacuum left by the U.S. retreat. Unless the president offers a more positive UN agenda, grounded in a shared multilateral purpose, America's loss of diplomatic leverage and global influence will only continue.